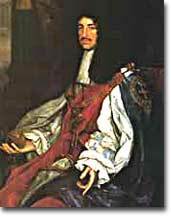 Charles II returned to the British throne in 1660, after the brutal dictatorship of Cromwell. It was under his rule that the Carolinas were founded. This disruption caused a temporary distraction from colonizing the New World. When Charles II assumed the throne, it was business as usual. The colonies that were created under his rule were known as Restoration colonies. It was in this environment that the Carolinas were created. The southern part of Carolina served first as support for the British West Indies. Soon the slave economy of the sugar islands reached the shores of Carolina. The cultivation of rice in the plantation system quickly became profitable, and planters in the hundreds and slaves in the tens of thousands soon inhabited Carolina. At the heart of the colony was the merchant port of Charles Town, later to be known as Charleston. African slaves became a majority of the population before the middle of the eighteenth century. South Carolina even experimented with Indian slavery, enslaving those captured in the aftermath of battle. Such was not the case for the northern reaches of the Carolina colony. The earliest inhabitants of this region were displaced former indentured servants from the Chesapeake. Most established small tobacco farms. Slavery existed here, but in far smaller numbers than in the neighboring regions. The inhabitants felt as though the aristocrats from Virginia and the Charles Town area looked down their noses on them. Northern Carolina, like Rhode Island in the North, drew the region's discontented masses. As the two locales evolved separately and as their differing geographies and inhabitants steered contrasting courses, calls for a formal split emerged. In 1712, North Carolina and South Carolina became distinct colonies. Each prospered in its own right after this peaceful divorce took effect. Carolina's royal charter was granted by Charles II to 8 of his generals who had supported him against Cromwell. This overview webpage from the Charleston County Library offers inline links to brief biographies of the Lord Proprietors. Illustrated. Lots to do here. One option allows the visitor to take a virtual walking tour of one of North Carolina's oldest and pretties cities. Catch a little history, see lot of nice pictures, and find out lots of stuff about this spot which was a hotbed of revolutionary activity. There's also an FAQ page which is actually a short history of the city.